WARNING: THIS STORY IS RATED PG-13 FOR ADULT THEMES AND A FEW SEXUAL REFERENCES. The tears slipped down her cheeks slowly, and she slid to the floor, the pain within her too much to take. It was her fault she'd ended up like this. Hers and hers alone. She should have never trusted him. If she hadn't, she wouldn't be alone on New Year's Eve, bawling her head off. She'd met him while she was on vacation. Her life in Australia had seemed to get a bit complicated, and she'd just wanted away for a few weeks. So she'd packed up a few bags and had headed to Miami, Florida. It was definitely a change of pace for her, and she liked it. One fateful night in July, she'd bumped into him at a club. It had been a complete accident that she'd walked in there; she'd just finished up shopping and was trying to locate a bathroom on the way back to her hotel. Within seconds of meeting him, she was enchanted by him, everything about him. 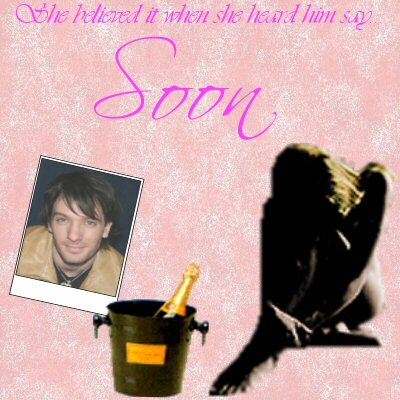 She'd always admired JC Chasez, the pop star, but JC Chasez, the man behind the beautiful voice, intrigued her even more. Things ended up not quite how she'd expected, and she ended up spending half the night with him, just talking. Along about 2 a.m., he drove her back to her hotel room and after a few surprised, heated kisses, they'd exchanged cell phone numbers. It only took a few days until they started seeing each other on a regular basis. Sometime around the end of August, she had two days left in paradise. That night, he wined her and dined her, and taken her to the beach for a late-night heart-to-heart. It had been then that he'd admitted that he'd been dating another woman for several months, an "ignorant actress looking to further her career"; his words. "Why... Why didn't you tell me, JC?" She was hurt, and let it show in her face. "I mean... I know this will never amount to anything... it's just a summer romance, but-"
He silence her with a breath-taking kiss that made her knees weak. "Sharna, it doesn't matter... because I love you." His words shocked her to her very core. "I want to be with you, honey." Tears trickled down her cheeks, and she looked up at him. I know it's not been but a few weeks... but I love you, as well." He smiled and kissed her deeply, his hands running over her back. "I'm leaving tomorrow." she muttered, breaking their kiss. "How will this ever work out?" "You can give me your home number, and your address, and once I'm able to drop her..." His eyes looked over her. "I'll come to you." His hand touched her face. "Since this is one of the last times I might see you for a while, can I- Can we... I just wanna be with you." He'd been so convincing, so enticing, and she found him too hard to resist. She allowed him to make love to her, to have her completely, and she was so blissfully happy afterward that she didn't realize what she'd done. He brushed her hair away from her face. "This is gonna work out perfect, Sharnz." He was a smooth talker, and sucked her in way too easily. He smiled and pulled her closer, the heat of his body overtaking her. "Sharna..." His stunning blue eyes caught and held hers. Tears of joy covered her cheeks, and he continued verbalizing all his promises. Sharna wiped her eyes as she sat in the bathroom, remembering every last detail of that night; the way he felt, the way he smelled, the way he tasted, the way he touched her ever-so-gently. And then she remembered how it'd felt just two months after that when he'd outed his relationship with the "ignorant" actress, and how'd she felt when he'd called the woman his "lady". "It's just a bit of publicity, Sharnz. It'll all be over soon." He'd tell her when she called. But along about November, he stopped answering her calls, and she was in complete denial, of course. "He's just busy." She'd told herself. On Christmas Eve, Sharna had found herself alone, thinking about him. She was sick, having come down with something that was certainly a stomach virus, and couldn't go to that Christmas party she'd been invited to with her roommates. She felt so alone, so depressed, and missed JC more than she could express. She'd do anything just to hear his voice. Wiping a tear from her eye, she reached for the phone. She knew he wouldn't answer, but she didn't care. She heard his all-familiar voicemail pick up, and realized she nearly knew the words by heart. Sharna rocked back and forth on the bathroom floor, so saddened that she'd let herself get into this situation. He'd lied to her every time he'd said "soon", and she knew that now, but there was no way to turn back. She slowly stood, weak from crying. She looked in the mirror one last time, at herself, and she was nearly disgusted. No, there was certainly no turning back. She slipped on her robe, her wet blond hair dampening the collar of it, and walked to her bedroom to change. Her roommates were gone again, and she was sick again, so, yet again, she was alone. She knew she shouldn't, but she took a bottle of champagne down from the cabinet and poured herself a glassful. As she took a sip, she began crying again and shook her head. "I can't let him do this to me." she whispered to no one. "I can't allow him to haunt me. I'm better off... He lied to me.. So he's going to miss out on the best thing that ever happened to him." She took another sip of the champagne. "Happy New Year, Sharna." she told herself, then poured what was left of the alcohol down the sink. It was the beginning of June, and Sharna was proud of herself. She'd not once had any contact with JC. She smiled down at something, and was suddenly disrupted by a loud knock on the front door. Her roommates were at work, and she had no idea who could have been at the door. When she opened it, she was surprised to see JC standing there. Then again, she wasn't abundantly surprised, since she'd heard just a few days before that he and his "ignorant" girlfriend had broken up. "Hey, Sharnz. I've missed you." "I'm sure you have." She cracked the door almost closed. His eyes met hers, and for once, she didn't feel weak in the knees. With that one word said, she shut the door in his face. He looked down and sighed. He'd screwed up. He knew it. And now, there was no way to fix it. So all he could do was walk away. Sharna took a deep breath and walked back down the hall to her room. She looked down into the little bed next to hers and sighed. The week-old baby boy looked up at her and cooed, as if asking who had been at the door. She slowly reached down and picked him up. As his little head rested on her shoulder, she tenderly rubbed his back. "Don't worry about it, Chase." she whispered, a tear in her eye. "It was just your father." SPECIAL DISCLAIMER: Yeah, JC is a big jerk in this story. I'm sure you understand that this is FICTION. So no hate mail, please. Thanks.